When traveling with a group that ranges from 12 to 90 in age as we did on the Carnival Splendor, planning shore excursions that are appropriate and enjoyable for all can pose a challenge. St. Croix is a lesser-often visited port and does not have as large of a selection of shore excursions as some of the more commonly visited ports. We didn’t see anything suitable for everyone that jumped out and said “We must do this” from the shore excursions offered there. Prior to the cruise I did a bit of research online and discovered that likely we would find something to do if we just got off the boat and walked to the end of the pier. Doing things on your own sometimes also saves money over booking excursions at every port. Sure enough when we finally reached the end of the pier we found locals with signs offering shuttles to a variety of places like beaches or a town on the other side of the island and a little booth with a couple choices for island tours. Just beyond the port gates a number of portable booths held all manner of things for sale, including Larimar jewelry at very good prices. A few more yards walk led to the town of Fredericksted with many more booths where locals hawked their wares along the shore. The other side of the street had permanent shops. It’s nice to visit a place in its native state with local stores rather than the usual sterile cruise ship port with the same stores as every other port. People flocked to a beach next to the pier, which seems to have a lot of good reviews online. The driver on the tour we chose advised avoiding that beach. He said it was not the cleanest beach around as that one sometimes has issues with sewer drainage emptying there when St Croix’s aging sewer system is under repair or having problems. The booth offering island tours had one that went around a large portion of the island including the other town, Christiansted for just $25 per person. Another stayed in the local area and included things like a botanical garden. They said the longer tour was the better deal as besides being longer it had less places that required an additional admittance fee. We drove through a rainforest on winding narrow 2 lane roads with potholes that go unfilled because much of the money sent to the US Virgin Islands goes to St. Thomas, which is smaller, but more visited by tourists than St. Croix. The driver was pretty good at dodging the potholes, something he’d obviously had a lot of practice doing. He pointed out Cane Beach, which he said had the best snorkeling in all of the Caribbean. I’m assuming he meant shore snorkeling by that. In the rainforest we saw interesting trees like breadfruit and one that they use the fruits for medicinal purposes. He liked to pull over in random spots to point out the things that grew there. We made a brief stop at Mt. Pellier Hut, home of the beer guzzling pigs. They weren’t open yet so we came back later, but that story is in another blog. Chickens ran free in many of the island’s yards. At one point a mongoose ran across the road and one of the passengers asked what they eat. “Chickens and eggs,” the driver said. After a pit stop at a lovely resort we went on to see the beach where Christopher Columbus landed on his second voyage to the Caribbean. A bird of unknown species wandered slowly through the sand, which was flecked with bits of dead coral that had washed up on the beach. Something that looked like some sort of shredded bark lined the water’s edge. I have no idea what it was, possibly some sort of seaweed or something. The beach had a couple palapas and some palm trees. We saw a random dog wandering about the beach with its owner, the first of many random dogs we saw throughout this cruise. They were the only ones there not on our tour, so it looked like a good place to go for anyone looking for a beach away from crowds. We had an hour in Christiansted, a town on the far side of the island. It is larger than Frederickstad and the only other city on the 82 square mile island. People were free to shop or explore or visit the beach. On the way into town we had passed the island’s oldest church, built in the 1700’s. My mother and I hiked back up to the church to take some photos. While there saw some speedy little geckos who really did not want their picture taken and a bigger lizard who not only stayed still, but even puffed out a big yellow ruff under its chin. As a bonus on the way back down to the main part of town we found two more old churches and some huge crazy looking caterpillars. Reasonably priced Larimar jewelry could be found in the jewelry shop there. Some of the booths near the ship had considerably cheaper larimar jewelry, but not in as professional of settings. Larimar is mined only in the Dominican Republic. Jewelry stores around the Caribbean have larimar jewelry, but usually at a much higher price. On islands near the Dominican Republic such as the Virgin Islands or Grand Turk locals make very affordable larimar jewelry. Besides the lovely blue color, larimar is claimed to have healing properties. On the way back to the ship we stopped at a rum factory. Nobody on the van really wanted to tour the factory, but as the driver had mentioned stopping back by the bar with the beer guzzling pigs on the return trip a few of us chilled in the waiting area there while the driver took the rest of them back to the ship. We would have done the tour if they had started right away, but by the time they were ready to go the driver was back so we went off to see the pigs instead. 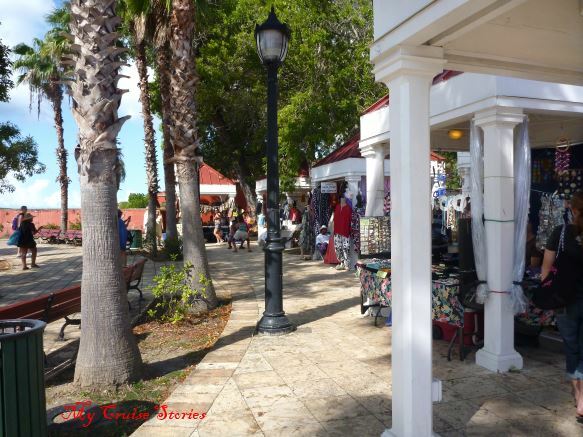 This entry was posted in Caribbean, Carnival, Port Cities, Ports of Call, Shore Excursions, Splendor and tagged cruise, dog, island tour, larimar jewelry, photos, St Croix, travel, Virgin Islands. Bookmark the permalink. Having a low-key island as a stop is (at times) an oasis … thus just a take it easy day of some sort .. but I haven’t visited St. Croix. Between Puerto Rico and Miami the Splendor stopped at 4 of the seldom visited islands so we got to see quite a few of them. I couldn’t resist: I jumped ahead and checked out the beer guzzling pig. Is drinking beer that pig’s purpose? Or is it being raised for slaughter? The pigs are there to entertain. They said they are pets and they don’t eat them. As usual, this blog was very interesting and informative. What is that caterpillar eating? The natural beauty of the island is one thing that makes it interesting. You did an amazing job getting that sign about Columbus so that it is actually readable on the blog.